Many fragrances use orange blossom so generously that you can learn its nuances by picking up a blend like Atelier Cologne Grand Néroli or Louis Vuitton Sun Song. If you want to experience the orange blossoms in their unvarnished beauty, then short of finding yourself a bitter orange tree in bloom, you can look for it elsewhere. For instance, in a bottle of orange blossom water. 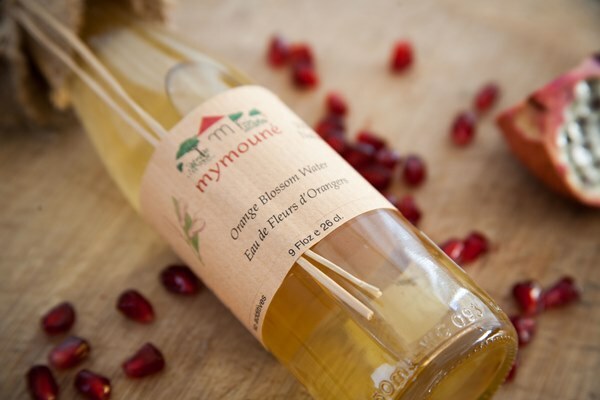 This flavoring common in Middle Eastern and Sicilian cuisine is made from steam-distilling orange blossoms. The oil is separated out to be used in perfumery, but the remaining liquid has a heady scent that makes it ideal for ice cream, rice puddings, and lemonade. I once wrote an article about 10 ways of using orange blossom water, although I could think of a hundred of different applications for this aromatic liquid. To approach this exercise like a perfumer, put orange blossom water on a blotter and study it over time. How does it smell at the beginning? How does it evolve? What happens if you put it on skin? Do you notice the green nuances giving way to the mossy, tangy darkness that is the infamous indoles? Then you can blend a cup of café blanc and enjoy the nuances of orange blossoms in yet another way. One of the most orange blossom redolent plants that doesn’t belong to the citrus family is the black locust tree or robinia. It usually starts blooming in the late spring-early summer, and if you live in the lands with no orange groves, then it’s your chance to experience a bit of their heady glory. 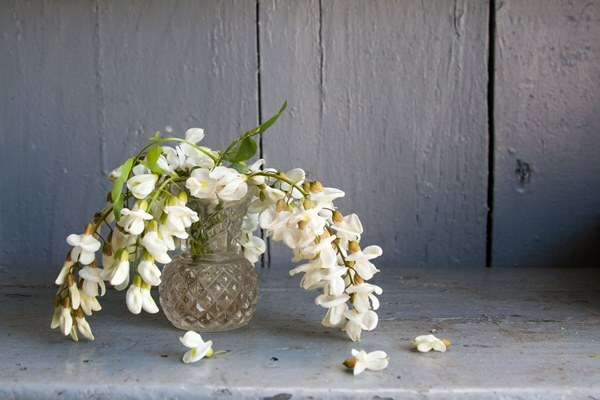 Black locust blossoms have a touch of coconut, with softer indolic notes than orange blossom, but when the flowers burst into bloom, the effect is spellbinding. Just like orange blossoms, they are edible and can be candied and made into jams. Another sister-in-scent to the orange blossom is wisteria. Different varieties of this climbing plant have different aromas, but the sweet orange blossom inflection unites them all. In perfumery, if one wants to create a wisteria accord, one starts with an orange blossom and adds a bit of peach. If you live in a place where you can encounter fragrant wisterias (the ones in colder climates aren’t as perfumed), you can probably find an orange blossom tree as well, but I feel duty bound to mention this flower. Finally, one of my most beloved scented plants is philadelphus. 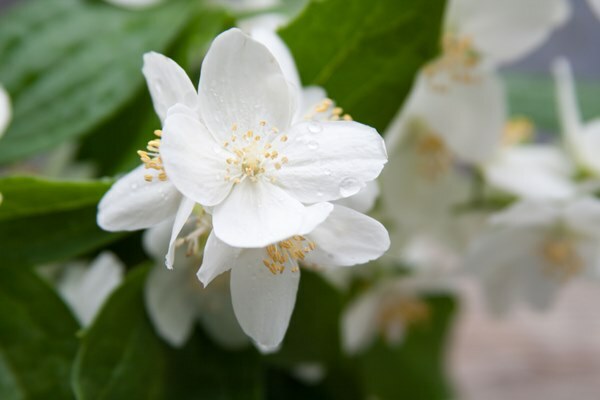 So close is its perfume to the orange flowers that it is even called mock orange blossom. The flowers are white and bloom only for a short while, but while they do, they smell so opulent that I feel as if merely standing next to a shrub perfumes my skin. Their fragrance has something of jasmine as well, but not being a nightblooming plant, the mock orange is softer on indoles. Either way, it’s a common ornamental plant in cities, and seeking it out is an olfactory pleasure with few equals. What are your favorite scent plants? Or favorite orange blossom perfumes for that matter? Karen A: Driving in southern Turkey when the orange trees were blooming was amazing! Although not the bitter orange, the fragrance was exquisite. We’ve got some black locust trees and it’s just glorious when they are in bloom. Victoria: I can just imagine it! 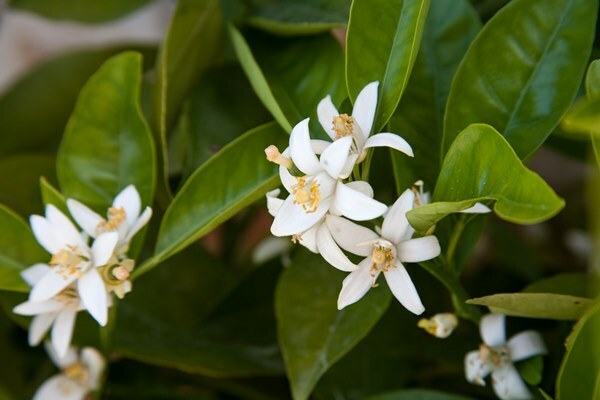 Even regular, sweet orange trees have a very strong and wonderful scent. 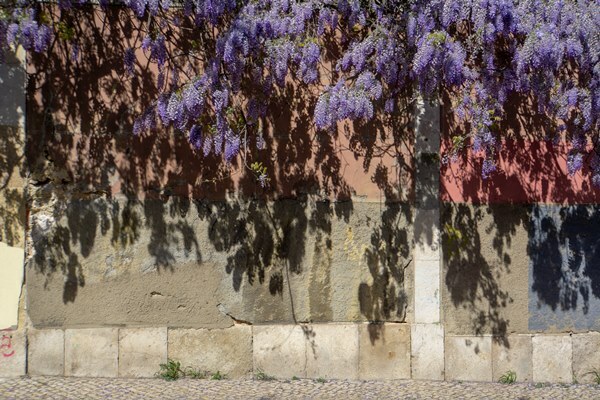 I was recently in Lisbon, and sometimes I would turn a corner and notice a magnificent scent. After walking for a while, I’d come upon an orange tree. Austenfan: I remember the scent of the bitter orange trees in Phoenix, Arizona; my first experience of orange blossom in the wild. One of the few things that smelled good there (the desert has few smells and the city smelled mostly of car exhaust). Austenfan: I mostly like them as well, but I remember not liking the Houbigant, which was somehow too dense (if that makes sense) and I’m not a massive fan of Lutens interpretation either. Mind you, last time I smelled it was very long ago, so I might have a different opinion now. Your review convinced me to try Sweet Redemption, which is now my favourite By Kilian (not that I’ve tried all of them, but I’ve smelled the Œuvre Noir collection at least once). StellaDiverFlynn: Hyacinth and iris germanica are among my favourite scented plants, the former for its heady opulence and complexity, the later for its delicate clarity. Sandra: I am so jealous! Debby: Wisteria is such a stunning scent, I’ve not encountered any now I live in the Scottish Highlands, but they were common in my home town in Southern England, there was a beauty near my mother’s house, but the new owners cut it down (why?!). My favourite local to me now is wild honeysuckle, we are encouraging a patch of it in our garden and can’t wait for the warm summer evenings. Silvermoon: Hi Debby, I also love Seville a l’Aube. It’s one of my favourite orange blossom perfumes, alongside JM Orange Blossom. Both are very different of course, but orange blossom’s versatility is what makes it so special. Victoria: It does have a lot of jasmine in it. OnWingsofSaffron: Meat of course, not mest; and obvoiously bay leaves, not laurel! Hamamelis: Hi Andy, how nice to read your question. I always remember your kindness in my beginning perfumistahood. KatieAnn: Beautiful and fascinating read! I adore orange blossom as well. I like to sprinkle orange blossom water over ice cream and drizzle a little honey along with it. mj: As many Spaniards, I grew up associating orange blossom water to Roscón de Reyes, the cake eaten on Epiphany Day. Agua de Azahar, as it’s called in Spanish, is also used in many other desserts in the country. Klaas: Wow, Victoria, such a lovely article, yet again! How I love your blog, and the comments everybody makes……sigh……. Klaas: Hey Caitlenn. Well, it really seems to be just the neroli that turns bad om my skin, especially in De Nicolai’s neroli fragrances. Which is odd, because she is known for her quality ingredients. I have no problems with any ather fragrances I use. Victoria: Aw, thank you so much! I’m happy to hear it, and it means a lot to me. All of these comments are so fascinating and I learn a lot reading them. Inma: Such an interestingand inspiring article, thank you! The first thing I´ll do will be to get an orange blossom water and “study” it. I feel specially intrigued by Caron Narcisse Noir, another one for sampling. Inma: I would say it reminds me of Glicinias although a much thinner perfume, somehow just a layer of Glicinia. It is so subtle that it seems to include water and a lot of space. Nancy Chan: Lovely article. My favourite skincare product is Aurelia Probiotic dry body oil which contains Neroli, Lavender, Rose and Mandarin oil. This is really nice before bedtime, as the scent really relaxes and aids sleep. A must try for any Neroli scent lover. Sandra: Excellent article, I want to go and drink a cafe blanc. I don’t think I ever smelled the orange blossom.. we don’t have that in the north east. Victoria: Robinia blossoms are also edible. I never connected wisteria to orange blossom, but that’s been one of my most favorite scents since childhood. There used to be wisteria vines entwined with the branches of the covered wooden arched walkways near Central Park’s West 72nd entrance, and I used to wait for it every spring. There’s some now growing around Belvedere Castle, although they’ve been restoring that site so it may not be accessible right now. I know wisteria is considered a highly invasive plant, but I really hope they don’t remove it. I used to also love coming across it in Georgia (less often than you might expect, because gardners usually went to war with any wisteria that appeared in their yards). I used to find the orange blossom note in perfume too strong (and even a bit nauseating) but now I really enjoy it. My favorites are Seville a l’Aube and Histoire d’Orangers. I recently tried a sample of Houbigant Orangers en Fleurs and enjoyed that a lot. It’s lighter that Hd’O, but in the same family, I thought. Seville de L’Aube is like nothing else and actually reminds me more of a sweetened Habanita. I tried one on each wrist a few days ago and they really were like fond cousins. Habanita also has orange blossom, although it seems a lot less prominant to me in it. Carla: I spent some time at a local greenhouse recently burying my face in the jasmine blossoms. Such a heavenly scent. I walked away with pansies in containers as it is still cold here. Victoria: It should be easy to track down, as it’s one of the most common ornamental plants in the cities. Aurora: I always love your posts about perfumery materials with all the botanical details. I am ridiculously sentimental about spring flowers: hyacinths, bluebells (I currently stop every day to smell them in people’s gardens), irises, how I miss the ones in the garden when I grew up, the scent was luscious and I don’t know what type they were, wisteria which you mention (I didn’t know the scent was related to orange flower). Victoria: I find that these materials are often discussed without finding parallels among the more familiar scents, so it was interesting to see how large the olfactory world of the orange blossoms can be.